via A Negative Benefit. I thought this was awesome. The Passover Seder, the oldest continuously observed religious ceremony in the world, tells the story of the Jews' Exodus from Egypt. Jewish tradition says that people of each generation must imagine that they personally had departed from Egypt, and the sages say that each generation must tell the story in its own terms. The sages probably did not intend this. Joseph is going to Egypt. Joseph and Pharaoh are now friends. Elijah is a bit tipsy, but off to a good start. 30,000 households down, and its only 6:30! Pharaoh is sad to report that my father has entered immortality. I have taken his place in government and will do my best to honor his name. Joseph Congratulations to you, my master. Pharaoh Who are you, and why are you writing on my wall? Joseph I meant no disrepsect, my master. Advisor He is an Israelite. There are many of them. I do not know whether they are with us or against us. Pharaoh Let us deal shrewdly with them, lest they join with our enemies in time of war. Rabbi Eleazar ben Azaryah finally figured out why we're supposed to tell the story of the exodus at night. It's because it says "all the days of your life!" Is there a third Goldish kid on the way?! Did you get a new job?! Just How Much Does Being Jewish Cost? From Kosher food and dating to Shul membership and Yeshiva tuition, SerandEz's Ezzie Goldish will discuss the initial findings of the first ever Jewish Economic Survey*. The presentation will focus on discussing the current economic picture of the Orthodox Jewish community, providing knowledge and ideas you can use to plan your future. Both singles and married couples are invited to attend. Wednesday, May 6th, 8:00 P.M. This program is being sponsored by Mt. Sinai and Pazit, an organization charged with empowering Jewish women to take control of their financial futures. Obviously, I'm really excited at the opportunity to take this to another level. The ideas behind this are important on both an individual and a communal level, and bringing those ideas into people's day-to-day lives are really important both in the present and especially for the future of the Jewish community. A quick thank you to C^2 (who started this ball rolling), Tamar Snyder, G, Orthonomics, and others for helping it get this far already. I've been really impressed at the willingness and desire on the part of those who have seen it or heard about it to help out. Tomorrow I'll hopefully post some other interesting tidbits that I'm seeing in the trends. Meanwhile, please pass the survey along far and wide! The more data, the better the impact. Thank you! Jay Schottenstein, an Ohio business leader and philanthropist, has supported the translation and elucidation of the Talmud Bavli into English, Hebrew and French. The Schottenstein Edition of the Talmud is now utilized by more than 2 million people worldwide. There were actually had two guys from The Ohio State University at the meal, and Schottenstein lives in Columbus; they found it really interesting as well. With James' Ohio business dealings it isn't surprising he knows him; it is impressive, however, that he chose to name him in response to this question. Cool kiddush Hashem, though. (Also see the mouseover.) Princess D'Tiara thinks that if it were NYC, it should be switched to parallel parking and fire hydrants. The obvious guilty party would be that car that parks four feet away from another both in front and back, turning two spots into one. Great Elianna story: As Serach walked her to school today, while they were walking in next to a boy from another class, Elianna started singing Eliyahu HaNavi randomly. A second later, Serach heard the boy's mom say "Go down the steps, Eliyahu". Not so random, after all. BeyondBT has started a worthwhile project that fits well with my favorite R' Salanter quote about changing the world - change yourself. (If you scroll over the SerandEz at the top, you should see a few words.) They are asking people to join them in becoming better individually so that we can impact the community at large, by becoming closer to Hashem and being more conscious of what we do. Please read about it here. * Chofetz Chaim's annual suit sale is at Chofetz Chaim and I think other locations as well until 10pm tonight. My brother informed me that they had a nice selection of quality stuff this year, far better than what they've had in the past (which was already impressive). Evil black automobiles might get banned. Apparently since black cars don't relflect heat so well, people use more energy to cool themselves off in them. Climate alarmists will soon ban black t-shirts. Given that black t-shirts don't reflect sun light as well which cause a person to become hotter, the person is more likely to use their air conditioning causing more of a carbon footprint to be released on an already frail and dying planet. Anymore predictions you can think of??? Does He Have A Rav? One of the most commonly asked non-basic question that we get from people asking about guys for shidduch purposes is "Does he have a Rav?" Every time I get this question, I clarify first, "What do you mean?" Usually the answer is, "Does he have a specific rav he goes to for halachic (Jewish law) questions and for advice?" While I'm often tempted to ask why the assumption is that those two go hand in hand, I typically answer politely that the boy in question has a number of Rabbonim and Rabbeim whom he is prone to speaking to or asking questions of about different subjects. If the guy does have a particular Rav or Rebbe he is close with, I'll mention it, but I'm often struck by the surprise and shock on the other end* to the very idea that a guy will not have a particular Rav that he goes to for everything. More than one such call has resulted in a discussion on the subject, but I remember in particular a young lady who was extremely troubled by the idea that a guy she had dated for a while and liked very much, and was considering dating again, did not have a single specific Rav. This young lady was extremely bright, well-spoken, and was a serious bas Torah and professional - not by any means a brainwashed flake. Yet she was hung up on the idea that a boy must have a specific Rav that he goes to, or it was problematic. Aseih l'cha Rav - make for yourself a Rav: Isn't that a basic concept? That a person should have a Rav that he essentially submits himself to? Q: Does the concept of "Get Yourself a Rav" (Pirkei Avot 1:6, 16) mean that you must have one Rabbi for everything? A: "Get Yourself a Rav" is not an obligation. It is not stated in the Rambam or the Shulchan Aruch that one is obligated to have a Rav but it is exalted advice. If a man has a Rabbi, the Rabbi can direct and guide him. He helps to exalt him in a spiritual sense. But it is not an obligation. A person can therefore have more than one Rabbi. He can also have a Rabbi for all questions and issues except for one. For example, the Gemara in Shabbat (22a) writes that Rava followed his Rabbi - who was called "Rav" - in everything except three cases. There is also a concept called "Rabo Muvhak," i.e. a Rabbi from whom one has acquired the majority of his wisdom (see Bava Metzia 33a). Nonetheless, there is a halachah in the Shulchan Aruch (Yoreh Deah 242:4) that it is forbidden for a person to give a halachic ruling or to establish a yeshiva without permission of "Rabo Muvhak." The exact wording is that one needs permission from one's foremost teachers – "Rabotav Ha-Muvhakim." But how can one have more than one "Rabo Muvhak" - after all a "Rabo Muvhak" is a Rabbi from whom one has acquired the majority of his wisdom?! The Shach explains there (#12) he has "Rabo Muvhak" in Torah, "Rabo Muvhak" in Gemara, "Rabo Muvhak" in Halachah, etc… We see from here that a person can have various Rabbis, each in a different area. The ideal is obviously for a person to have one Rabbi for everything so that he can have a unified system of thought and practice. * Often by girls or mothers, much less often by fathers, interestingly. (Hat tip: Holy Hyrax) Every once in a while, you get to watch someone with a healthy dose of common sense rip into the leader of the country for taking the wrong tack. This is British MP Daniel Hannan slamming Prime Minister Gordon Brown for his horrible economic outlook and approach. Sadly, this would probably not go well in Congress - not only are most of the members of Congress not particularly good at speaking and getting points across in general, those that are tend to slip into dumb political gestures rather than sticking to substantive policy ideas. But it would be nice to see a member of Congress or the Senate (I don't care which side) take a similar slap at what's happening right now in this country, which is heading down almost as fast as the UK under similar policies. Best line: "The truth, Prime Minister, is that you have run out of our money." I enjoyed the point that every British child is born into about 20,000 pounds of debt; in the USA, children today are born with $22,000~ of debt, plus whatever the interest costs. It's astounding. R' Gil Student of Hirhurim has compiled a very good, clear, and concise [and free!] E-Book on Birchas Ha-Chamah, or the "Blessing of the Sun", which occurs just once every 28 years, and will occur this year on Erev Pesach (which, contrary to what some will tell you, has happened way more than just 3 times). As you can see from the first page, I helped R' Gil compile the posts and other online resources. All in all, after reading countless posts, some repetitive, some different, some normal, some slightly off, the subject is really interesting, even if the hubbub surrounding it is sometimes overdone: It still is just one bracha, and the idea that somehow this one is some special sign regarding Mashiach seems a bit strange. All the writers were kind enough to give their permission to use their posts for the E-book, and the posts which R' Gil included are good, clear, and detailed yet interesting to read. Please, feel free to download the book, print it out, and pass it around. We hope you enjoy! It always bothered me when people said "May you live until 120" - why limit a person like that? Some people used to say "Oh, you can't live past 120, since that's what Moshe lived" - silliness, since plenty of people before and during (if not after?) his time did so according to Tanach. Kazakhstan - A Kazakhstan lady, who mothered ten children, will be celebrating her 130th birthday this week, making her the world’s oldest person by 16 years. Sakhan Dosova’s age was discovered during a census in Karaganda in northern Kazakhstan, when the date of birth on her passport showed as 1879, which was the same year Edison invented the light bulb and Stalin and Einstein were born. Dosova’s age surprised demographers when they found that she had been on Stalin’s first census of the former Soviet region in 1926, when her age was given as 47, and they are now trying to confirm the record. For the 129-year-old lady, she puts her longevity down to her love for cottage cheese and her sense of humour, and never visiting a doctor or eating sweets. Happy birthday to her, and remember: Don't go to doctors. ccording to Michel Foucault (20th century French philosopher, historian, and sociologist) what was the main difference between punishment pre late 18th century and post late 18th century? Unsurprisingly, last time the question was asked (since it was a repeat as a few people noted - mistake on our part) a much smaller percentage got it right - 38%. Spying on Energy Offenders in UK?? I wonder how far this will all go? That's all I could think about while reading the op-ed and resignation later to AIG by Jake DeSantis, who slams CEO Ed Liddy for calling "distasteful" the contracts which were promised to employees of AIG - Financial Products repeatedly over the last several months. He also implicitly slams the government for causing this and for their (idiotic) 90% bonus tax. I was in no way involved in — or responsible for — the credit default swap transactions that have hamstrung A.I.G. Nor were more than a handful of the 400 current employees of A.I.G.-F.P. Most of those responsible have left the company and have conspicuously escaped the public outrage.After 12 months of hard work dismantling the company — during which A.I.G. reassured us many times we would be rewarded in March 2009 — we in the financial products unit have been betrayed by A.I.G. and are being unfairly persecuted by elected officials. In response to this, I will now leave the company and donate my entire post-tax retention payment to those suffering from the global economic downturn. One thing that's always bothered me is the ridiculous claims that "these people are the ones responsible for tearing down the economy". Even if someone wanted to blame the entire mess on credit default swaps (which is simply moronic, as someone who audited CDSs*), every financial company, bank, etc. consists of dozens, hundreds, or even thousands of employees - only a small percentage of which actually carry out CDSs. Within those employees, they are carrying out what seemed to be industry standard work by creating and trading CDS contracts, and rightfully so. This idea of "punishing" people is not genuine at all - it's a thinly veiled attempt at class warfare. Every single person who reads that piece and has already decided that AIG shouldn't get their bonuses will smugly say "what's he complaining about? His last bonus was 3/4 of a million dollars! ", ignoring that we're talking about breaking contracts, possibly the single most important section of laws in this (or any) free country. We're also talking about honor, commitment, and fairness. Every single thing so far with the AIG bonuses has been a smokescreen. This is not about "holding those responsible" for the economic downturn. It's about punitively punishing those who stayed behind to clean up some of the mess. It's about striking at those who make more money than we do**. If you would ask 100 people on the street what they know about AIG, they might say "they sell insurance", and they'd probably talk about how they got outrageous bonuses with government money. Nobody has any clue about AIG - they just know it was "rich people" getting more money, and seemingly from taxpayers (which is also almost all rich people now, but that's a different story). Yes - $165 million in bonuses were handed out, or less than 1/10th of one percent [0.1%, or .001 total] of the $170,000 Million (or $170 Billion) the US government gave AIG. That's a tiny percentage of the money heading to fulfill contractual obligations, while billions (!) will be wasted on things that have nothing to do with obligations or growth or anything of the sort. When President Obama announced the recent $787 Billion "stimulus" plan, which was criticized as being not stimulating at all but a debt-monger, he acknowledged that it "wasn't perfect" - admitting that hundreds of billions were not going to be used in useful ways in terms of what the bill was about. Perhaps more blatant was the many Billions of dollars in pork projects he waved through, despite campaigning on a promise to never allow pork projects. Billions (!) of dollars, or many times more than the contracts being fulfilled by AIG. The AIG bonus outrage is class warfare. Let's be honest at least about that much. * CDSs were effectively insurance on mortgages that were bought by their bank/hedge fund/company and that then turned bad. It would be like people taking out hurricane insurance in Florida, and then having the nerve to actually cash out on the insurance when a hurricane hit. What should they do? Not claim the money which is rightfully theirs? ** It's also about blaming a company which failed primarily because other companies (rightfully) asked for collateral calls that normally would be a cinch to make, then nobody would lend them the money to make the call despite knowing at the time that they'd be able to pay it back (again, rightfully, and they shouldn't have placed themselves so precariously - but that never was an issue until that day). In contrast to Babies 'R Us, as mentioned earlier, BuyBuyBaby was almost exactly the opposite. Serach called them up, since they're about a half hour away from us, and asked what they have in stock. They said we should let them check, and they'll call back in a few minutes. As they close at 9:30 and it was already 7:45, Serach called back again, and a manager answered and promised to call back within a few minutes with the answer. Five minutes later, he did, telling us that of the kind we wanted, they had three in stock, one of each color (blue, normal/oak, cherry wood). Two minutes after that, the original saleslady called back with the same information. I drove out to the store, walked in, and as soon as I walked in there was a man standing there who seemed to be a manager. He quickly pointed me to the back, where the furniture was. I noted that there were as many employees in each quarter of the store than in the entire Babies 'R Us, which is about the same size. When I got to the back, there were two employees at the (smaller) furniture desk, one of whom immediately asked how she could help; the other was helping someone else. I started to tell her that I'd called about a bed, and she pointed me straight away to the beds I was interested in, coming over a couple of minutes later to help out. When I called Serach to double-check which color we wanted, she said to just come over when I was ready and tell her. About five minutes later, I walked over, and she asked my last name; when I told her, she wrote it on a piece of paper that I noticed was already filled out, including my first name, which Serach had given an hour earlier when she called. I asked if she had filled it out ahead of time, and she said she had, except the color and last name, which she hadn't known. She then gave me the paper, said I should just hand it in at checkout, and the item would be waiting by the door. It was. Had I not also spent a few minutes buying a gate and nightlight, I could have been in and out in less than ten minutes - shorter than the time spent waiting to get a sales representative in Babies 'R Us. We'd been telling Elianna for the last couple of months that one of her birthday presents would be a new bed. She's been really excited about the prospect, and whenever you ask her what she's getting for her birthday she'll say excitedly that she's getting a bed. Today, I went with Kayla to Babies 'R Us and Target near the Whitestone Expressway. I started walking the aisles of Babies 'R Us, and nowhere could I find the children's beds so nicely advertised online. After a while, I saw on the far side of the store, all the way up high, 4 children's beds. After searching vainly for someone to help me out, I found one worker who informed me that in fact, that was all they had in stock. Ordering the ones I'd seen online, he informed me, would take 7-14 days to get shipped. Disappointing, but understandable; it's unreasonable to expect them to carry every bed in stock. I went back, looked at the beds (or what I could see from 20 feet below them), and decided that two of them were possibilities for Elianna. I looked around again for someone to talk to, finally walking to the cashier area, where they told me that I needed to go to the furniture desk. I walked over to the furniture desk, where there was nobody sitting, and waited, while keeping my eye out for an employee. After 5 minutes of noting not one worker within 150 feet of where I was standing, I walked back to the front of the store, found a couple of workers standing around, and mentioned the empty furniture desk; one of them pointed to a man helping a young lady in the stroller section and said he was the person I needed. After waiting a few more minutes, the man was available, we headed back to the furniture desk, and he asked what I was looking for. I pointed out the two beds I'd thought would be appropriate, and after clicking around for a few minutes, he told me that they were out of stock, but he could order them - and it would take 7-14 days. I asked what the difference was between that and ordering online; he said "with online, you never know how long it will really take." Hmm. I asked how often they do have the beds in stock, and was told "Well, we never really have them in stock. Whenever anyone wants one, we just order it." I thanked him for the information and left the store. What?! How bogus is that? If I wanted to order the product and wait a couple of weeks, I'd be using your website. I don't expect a store to carry at all times every product, but to never carry any of a product you're claiming to have in store is just wrong - especially when you're pretending on the shelves that you carry it in stock. Worse is the clicking around to "check" if it's in stock, when you already know that you don't carry a single one. Had I not asked how often they have it in stock, the implication would be that they usually have beds, but I picked an unlucky day. It's simply gross customer service and a disgusting way to run a business on the part of Babies 'R Us. I never understood why companies switch bags. The savings can't be that much at the bulk they're getting them, and as soon as people realize, they demand double bags every time. In addition, people become more and more frustrated with the store and - consciously or not - create bad associations with going to that store: "Oh man, it was so annoying to shlep out there, then the bags ripped, it was such a mess, and the baby was crying..." This is especially true if something breaks, as is bound to happen. All in all, a poor, unsuccessful day of shopping. Sigh. 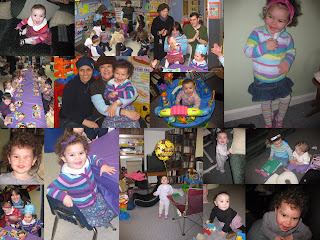 Yesterday afternoon, we went (a day early) to Elianna's school to celebrate her 3rd birthday with her. It was really cute, with her friends sitting around the long table while they sang songs, someone lit candles for her that she blew out, and they sang some more, played, and had a good old time. A little while later, I drove Elianna & Kayla to Hillcrest, where we met up at a pizza store with my grandparents so they could eat lunch, though it was already 4:00 in the afternoon. They'd been at their apartment all day, watching the movers pack up all their stuff for their trek to a senior residence in Philadelphia, after 60 years in Bellpark Manor. They were in a rush to get back, as my grandfather was - of course - doing a few last things for the shul before this morning's move. In the brief time we were sitting there, Elianna was playing with my grandfather, and while I don't remember exactly what she said that made my grandmother comment, it must have been something about my grandfather's ears. "Tell her they don't work so well as you get old", she laughed. (My grandfather has hearing aids which are... moderately helpful.) She then added how as we get older, we revert - when we're young, we go from crawling to walking to running - to walking slower and slower to needing help to walk to not being able to walk almost at all. I thought this was particularly interesting after talking to my mother a short while later. On a recent Monday, the women entered Menorah Park’s synagogue for a dress rehearsal. Three used walkers. Another carried a small oxygen tank. As they rose to speak, they left their medical gear by their seats. They approached the bimah unassisted, some limping, and steadied themselves at the lectern with both hands. Practice began with prayers in Hebrew. Some women stumbled and stuttered through the complicated scrum of consonants. Those who had taught Sunday school for decades spoke more fluidly. Next came the speeches, which traditionally respond to the Torah passage read in synagogue that week. Rabbi Kutner had consulted old calendars to determine the week in which each woman would have spoken at age 12. He asked them to prepare messages based on the passages they would have addressed eight decades ago. When Ms. Bonder was a child during the Depression, her parents lost their life savings in a bank failure. She later served as an aide to a United States senator. Her speech drew parallels to her Torah reading about Joseph, who rose from slavery to become a pharaoh’s chief adviser. Belva Singer, 91, meditated on the power of the Birkat Kohanim, the ancient Priestly Blessing. In addition to being the Priestly Blessing, it's also part of what we say each week when we bless our children. It's interesting to think about my grandparents moving into a senior residence, as they move away from some of the bigger stages of their lives, on the same day Elianna is turning three, setting out on the beginning stages of her own life, and as Kayla starts to babble and cruise along anything she can pull herself up against. Life's pretty amazing. EsPes pointed this video out, and it's awesome. A little over a year ago, I had an argument with my old boss about one of the issues mentioned. She didn't understand what I meant when I said my job is secondary in my life to my family. Very Funny video and very true. Often we hear people telling us that labels are bad, that judging is bad, that being open minded is good. The thing is - that doesn't seem to help. The very people who go around telling you to be open minded are often just as closed minded! I can't even count how many times I've had conversations with people who argue that someone else isn't being open minded, when that person is not being at all open minded, either! Who knows - maybe I'm guilty of the same thing right now. But even if I am, I think it's wrong. Just because you don't agree with someone doesn't mean you should write that person off as stupid or say there is no value in what that person is doing. There is value in more than just your way of life. People who are different haven't turned their brains off. They aren't all idiots who haven't as yet been enlightened to your way of doing things. Sure, there is a herd mentality in any group of people. Any group of people. Including people like you! And in all groups, there are also people who really do think and who actually do believe that what they are doing is correct. Just because someone has different values than you doesn't mean that person has been brainwashed to an incorrect, ignorant, intolerant way of life. I have been fortunate enough in my life to be close friends with people both more to the left of me and more to the right. Maybe I'm unique in that way. Maybe lots of people haven't had such an experience. Maybe too many people only know on a closer level their own brand of thinking but haven't seen, except from the distance, another way of life. Maybe they haven't heard people talk passionately about other values. You don't have to agree with everything you hear and you don't have to change what you believe, but I think there is incredible value in being able to hear what someone's point of view is and see value in it. That doesn't mean agreeing with it. It means seeing value in another way of life. Yeah, sure, there are plenty of opinions out there that are downright idiotic. There are also plenty of beliefs that, though you may not agree with them, have a lot of value to the people who do agree with them and are still a Torah way of life, even if they are not your way of life. Don't knock people who do things differently than you do. Try and understand them. Understand where they are coming from. Understand why they believe what they do, why they practice the way they do. A lot of us think we know a whole lot more than we actually do and we certainly do not understand others on any helpful level. I understand there is this need to feel so vehemently that your way of seeing things is the most correct - maybe even the only correct - way. It's safe to believe that because that justifies everything you do. It helps make everything make sense. Why would you believe a certain way and act a certain way unless you felt it was most correct to do so? Maybe people are too afraid of trying to understand others. Maybe they feel they'll get confused, not know what to believe anymore. I don't know. It's only a guess. But maybe that would be a good thing. Judaism is a religion in constant growth. We're constantly evaluating and re-evaluating, thinking, analyzing. That's learning, if you're going to talk about learning. Why learn if you're not going to think? That would be brainwashing. True learning means you're involved in what you're being taught. You're growing. You're actively engaging the Torah, Judaism, God. So then why would Modern Orthodox parents be so afraid of their children going to Israel and coming back "so frum?" Isn't it also a kind of brainwashing if Modern Orthodox parents want their kids to remain forever the exact brand of Modern Orthodoxy as they were brought up? In some ways, everyone is brainwashed. Parents have certain values they believe in and they want to impart those values onto their children. That's fine. That's good! But then give your child room to develop on his/her own. There is nothing bad about a kid thinking about Judaism and deciding to have certain reasonable opinions. Of course, then you can get into a whole debate about what is considered reasonable, but that also treads dangerous water. There's a fine line between imparting values and not letting someone grow in his/her beliefs. Beyond that, it's so dangerous to start judging other groups of people (specifically, other strands of Torah-Following Jews) without understanding them. On what basis are you judging? You don't like something they do, so don't do it. If it's not against halacha but is more stringent than how you would do something, that doesn't make it ridiculous! And the other way around - if someone is following halacha but is taking a more lenient (but valid!) approach than you would, that doesn't mean that person is "sketchy" or "not frum." No, what I find ridiculous is how everyone feels he has the right to impose judgments on someone else who is not doing anything wrong. Just because there are flaws in one system of doing things doesn't make the entire system invalid! There are flaws in your own system too - whatever that system may be. Fix your own problems. They maybe you can start worrying about other people's. ...we're about to find out. SerandEz & kids are headed to Staten Island this Shabbos, thanks to one of the nicest couples in the world (go Josh & Stef! ), and having been there only once briefly before, it should be really nice. For those who are interested, Serach will be selling both A Goldish Touch headbands and tichels (scarves) from SerachScarves this motzei Shabbos, March 21st, 8pm - 12am at the Young Israel of Staten Island on Forest Hill Road at a pre-Pesach boutique taking place there. She'll also be helping to host two Michal Wigs sales on Sunday, March 22nd, and Monday, March 23rd in Kew Gardens Hills, Queens from 7:30-9:30pm, and at least the first of those she will have her headbands and tichels. The details and addresses are here. Have a wonderful Shabbos, everyone! וַיִּשְׁמַע הַכְּנַעֲנִי מֶלֶךְ-עֲרָד, יֹשֵׁב הַנֶּגֶב, כִּי בָּא יִשְׂרָאֵל, דֶּרֶךְ הָאֲתָרִים; וַיִּלָּחֶם, בְּיִשְׂרָאֵל, וַיִּשְׁבְּ מִמֶּנּוּ, שֶׁבִי. [Numbers 21:1] And the Canaanite, the king of Arad, who dwelt in the South, heard tell that Israel came by the way of Atharim; and he fought against Israel, and took some of them captive. [Numbers 21:2-3] And Israel vowed a vow unto HaShem, and said: 'If Thou wilt indeed deliver this people into my hand, then I will utterly destroy their cities.' And HaShem hearkened to the voice of Israel, and delivered up the Canaanites; and they utterly destroyed them and their cities; and the name of the place was called Hormah. The other day the Jerusalem Post published a letter from Gilad Shalit's mother addressed to her son whose imprisonment is now approaching 1,000 days. I sit here in a tent on a street corner in Jerusalem. Almost a thousand days have passed without you by my side. For almost a thousand nights I have neither seen the light in your room, nor in my life. For almost a thousand mornings I haven't seen your smile, the smile of a boy waking up to a new day. The smile of a boy who loves life. Someone who is a part of me. For almost a thousand days I have dreamed of you at night, thought about you while I tend to the gardening, something I do so I won't go insane. Almost a thousand days… and every hour, every minute, every second are an eternity. I sit in the tent at the gates of the prime minister's home surrounded by the people of Israel, dipping in a sea of love and support, while in my heart only one question continues to linger: Where are you? And my voice is not heard. I do not yell. But my eyes scream and my heart roars at the country's leaders: "Please, release my son! Bring him back to me, to his mother." Almost three years have passed. A lot of things happened Gilad, but really, nothing happened. For almost three years, I have sat at home, hoping not to be exposed, protected my privacy, just to be myself… and you Gilad, what is the place where they're holding you like? Do you see the daylight? Are they taking care of you? What do you eat? Are you in pain? How do you count the days? I trusted my country to fulfill the commitment between me, the mother sending her son to the draft, and the powers that be, but they have not returned you. And here, the thousandth day is approaching and you are still there, "buried alive" in the cruel chill of Hamas. Yesterday, the prime minister said he could not bring you back. The price is too high. They want a whole lot for you. You are worth a fortune. The price is too high, too high for the country for which you went on a mission. Gilad, I turn in your name to the prime minister and his ministers and beg: "Enough! Please, enough!" Gilad's place is in Mitzpe Hila. This is his home and this is where he should be. With me. With us. Don't forsake him. He does not deserve it. I waited when you exhausted all possible options, but I cannot wait any longer. Every beat of my heart calls out for you, every breath I breathe yearns for you. Please, I want my son. Gilad, in your name, I call out to every mother in Gaza. There are mothers with aching hearts there as well, who wait for their children. Demand from your leaders to compromise and bring back whoever they can. Pressure them, so that the door to the love of parents to their children will open and perhaps, with it, the door to peace. Gilad, I want to hug you, hold you close to me and to the bosom of your family. I want us to return, as a united family, to our comfortable anonymity that we once had. I want my son, Gilad. This letter moved me, and while there is little I felt I could add to its sentiment, it DID get me thinking about the failings of our current leadership to bring this unfortunate incident to a close. Of course, we ourselves are not without blame (the Talmud states [Bava Kamma 52a], “A goat leads the flock. When the shepherd is angry at the flock he blinds the goat.” Rashi explains: “Blinding the goat makes it fall into pits, and the flock falls in after it. Likewise, when G-d wants to punish Israel, He appoints disreputable leaders for them.”). Even the most cynical person admits that if the Jewish People collectively and unrelentingly declared that for this to continue another day is unacceptable, our leaders would be unable to ignore it. As the CEO of this business that employs 140 people, I have accepted the fact that Barack Obama is our new President, and that our taxes and government fees will now increase in a BIG way. To compensate for this additional overhead, I figure that the clients will have to see an increase in our fees of about 8%. However, since we cannot raise those prices right now due to the dismal state of our economy, we will have to lay off several of our employees instead. This unfortunate economic reality has really been eating at me for a while, as we believe we are family here, and I didn't know how to choose who will have to go. After giving it considerable thought, this is what I did: I strolled through our parking lot, found 11 Obama bumper stickers on our employees' cars, and have decided these folks will be the first to be laid off. I can't think of a more fair way to approach this problem. They wanted change; I gave it to them. If you have a better idea, let me know. The police in Queens are apparently concerned about a series of attacks recently on random girls and women. A little while ago on our block in Kew Gardens Hills, a 13-year old girl was walking down the block when a car stopped, a man got out, and started hitting her over the head with something, trying to grab her and hurting her. The girl did not know the man, who, after she kept screaming very loudly, drove off. I heard brief screaming from our apartment, and when I glanced outside a few seconds later, couldn't really see anything except what looked to be a young girl at the edge of where I could see, holding her head, kind of walking out of my vision range. A neighbor a few doors down apparently saw the entire thing out her front window, immediately calling the cops and ambulances (I saw the ambulances a little while later when I heard them leaving). She isn't sure what the man was hitting the girl with (possibly a gun, unclear), but the girl was bleeding from her head and was knocked to the ground and hit. The police told the neighbor that people should stay inside, keep their shades down, etc. They think this incident might be connected to other recent attacks in Queens. Please be careful when going outside and take any necessary precautions. Last night, via VIN, I read an excerpt of an excellent piece in the Jewish Press by Rabbi Dr. Jonathan Schwartz. I contacted him, asking for permission to re-post that piece; he sent me a more full version of the article, along with another, related piece that I thought was even better. I am going to post both of the pieces below this one in full; they're important reads, as I think we've all seen cases where people act like this, and it can cause or be a manifestation of a more serious problem. As a slight commentary on the articles, I felt that in the Jewish Rituals piece the examples used are slightly extreme and therefore too easily shrugged off as "well, I would never act like that". It seems that even smaller examples which are similar are often indicative of a problem, which simply doesn't seem to be "that bad" because of its less obvious nature. Beyond that nitpicking, I thought both pieces were quite good and are important reads. Healthy and scrupulous religious beliefs do not interfere with the normal practice of the religion. Scrupulosity frequently interferes with the proper practice of religion. Please read the articles - I think that you will find them very worthwhile. Sarah, a 30 year old mother of 2, is preparing for her trip to the Mikvah. She removes her nailpolish, cuts her nails, combs her hair carefully to remove all potential Chatzizot (separations) that may impede the path of the Mikvah water. However, instead of feeling a sense of wholeness and fulfillment at a job well done, Sarah dreads her mikvah experience. For as soon as she completes her preparations, she begins them anew, worried that she might have missed something, rendering her Mikvah trip “useless” and she, “unclean”. Is Sarah unique? Many look to her and admire her Frumkeit and sense of devotion. However, those close to her know that her monthly inner-torture with the Mikvah is not a result of her personal scruples. What they do not know is that Sarah, like many other Jewish women, suffers from Scrupulosity. Scrupulosity is a term given birth to in the 1600s. Today, it is a well-documented form of Obsessive Compulsive Disorder (OCD). It is typically evident in people who believe that their religious behavior is in some way displeasing or disrespectful to Hashem. This preoccupation is often accompanied by the emotional experience of anxiety, common to all forms of OCD, as well as a presence of guilt which exacerbates the pain. The guilt in displeasing Hashem and the feeling that one can never “do it right” often contribute to an associated depressive quality in this OCD subtype. One of the great Chassidishe Rebbes, Rabbi Nahum of Stephanesht described the intertwining of these elements in Scrupulosity: “Scrupulosity is a cloak made of pride, lined with guilt and sewn with melancholia.” As a result, many engage in repetitive and excessive prayer or other religious behavior to correct the pain, as part of the disorder. The Halachos of Niddah in general, and of Mikvah in particular, are a fertile ground for Scrupulosity to rear its head and torture those who suffer with it. Some women suffer from extreme anxiety when performing Bedikot – constantly worried that they did not perform the Bedikot properly. In the extreme, this leads to repeated unnecessary Bedikot which can irritate the area and cause unnecessary bleeding. Others, engage in repeated examination of Bedikah cloths, unable to determine if a stain is present or even if there is a Shaila to be asked. Still others become unable to accept the reassurances of the Mikvah attendant and the Rav that the Tevilah was indeed complete and that they are, indeed, Tehorot. When practices go further than the requirements of religious law, one might be mistaking Frumkeit for scrupulosity. For instance, if a ritual requires washing Netilas Yadim twice on each hand, the person with Scrupulosity will repeatedly wash to be sure that he covered each hand twice until the wrist often washing twenty times or more. If a woman must do a Bedikah twice a day during the Shiva Nekiyim and redoes them twice an hour, she might suffer from scrupulosity. When the person becomes overly preoccupied with a focus on a seemingly trivial part of the ritual instead of the whole picture, s/he is likely to be expressing behavior more akin to Scrupulosity. When a religious patient is more focused in prayer on “pronouncing it perfectly” instead of developing a sense of proper Kavanna, the focus is more like scrupulosity than Frum. Similarly, the woman concerned about the perfect pronunciation of the Beracha in the Mikvah instead of on the Tevilah, might be expressing a sense of Scrupulosity. Healthy and scrupulous religious beliefs do not interfere with the normal practice of the religion. Scrupulosity frequently interferes with the proper practice of religion. For instance, when a person with Scrupulosity OCD does not attend Minyan because of the fear that s/he cannot contain intrusive thoughts, s/he is expressing scrupulosity. The woman who automatically adds onto her Yimei Tumah because the Bedikah cloth “didn’t come out perfectly white” without asking a Rav, limits her ability to complete her Tahara process and resume a healthy family relationship. Such indiscriminate decision-making may be a result of Scrupulosity. The pre-occupation with doing rituals until they are “perfect”, the repetitive praying, vigilant repeated Mikvah preparation and dunking and unnecessary penance-seeking found in Scrupulosity closely resemble the typical OCD symptoms of checking, repeating and asking for reassurance. The person with Scrupulosity often demonstrates behaviors that are persistent, unwanted and repetitive. Remember: Strong religious convictions do not cause or imply Scrupulosity. Rav Yisroel Salanter (Ohr Yisroel, Letter 25) recognized the difference between Zehirus and Scrupulosity. Scrupulosity is a type of OCD, which is a psychological disorder. In these cases, a person’s religious convictions are merely one aspect of his or her being that OCD uses to cultivate doubt and create anxiety. It is not connected to Torah observance or religious life at all. If OCD didn’t attack a person’s religious beliefs, it would surely take on a different form, whether that be a contamination fear or a checking compulsion or another arena for OCD to unleash anxiety. Scrupulosity takes strong religious ideals and blows them out of proportion, making them distorted and corrupt. One of the most successful approaches to treating Scrupulosity is with cognitive behavioral therapy (CBT). CBT therapists encourage their patients to see that their behaviors can vary and that one’s sense of self is better off being accepted rather than always being constantly critically evaluated. Given our religious culture that is constantly encouraging us to become or “be” better persons, it is easy to see how patients find it hard to navigate these new ideas. Therefore, it is not unusual for therapist and patient to consult with a patient’s Rav during this initial phase of therapy in order to sanction and help navigate this apparently “irreverent” therapy. The Rav and patient need to be assured that the treatment course is not designed to adversely impact one’s religious beliefs. Rather, they should know that treatment is solely targeting a disruptive anxiety disorder which produces seemingly devout behavior that is actually unrelated to one’s genuine degree of religious commitment. In fact, often the ability to distinguish real religious from scrupulosity often helps enhance one’s devotion to Yiddishkeit. The actual treatment course for Scrupulosity does not deviate significantly from other types of OCD. Generally, a hierarchy is constructed, in which persons are gradually exposed to accelerating levels of risk. This is in accord with the concept expressed by the Chovos Halevavos that one of the principles of Zeheirus is not to be too Zahir where improper to do so. Exposure exercises at a lower level might entail things like lowering the amount of time spent on examining a Bedika cloth. An example of a more moderate range exposure could involve the limiting of total Mikvah preparation time to 1 hour, knowing that the preparation might not have been completed fully. Often, people with Scrupulosity are referred to by family, significant others, Mikvah attendants Rebbetzins or by Rabbonim and Roshei Yeshiva due to the tendency for those with scrupulosity to misperceive their excessive behavior as functional (See the list of Haskamos to Yaakov Grinvald’s Eitzos v’Hadrachos for a listing of Gedolim who understood the difficulties). So when taking scrupulous stock of Taharas HaMishpocha, keep these guidelines in mind. Where resolve for the Mikva preparation is a drive to keep the Mitzva in the best manner possible, then one becomes filled with a sense of fulfillment and Tikvah through the Mikvah. However, when the scrupulous preparations are purely driven by a fear that passing up a specific opportunity would be indicative of your overall poor character due to your lack of scruples, you might be suffering from Responsibility OCD or Scrupulosity and it might be in your best interest to seek professional help. Have you ever been told that you spend too much time making lists and schedules? Do you think you do? Have you been so involved in the small details of what you were doing that you lost sight of the main thing you were involved in? Would you describe yourself as perfectionistic? Would others? Do you have difficulty making decisions because no side of a particular issue is 100% correct? Have you ever failed to complete a project on time because of your attention to organizing or your high standards for that project? Would you call yourself a workaholic? Would others? If so, do you spend so much time working that you have little time for family, friends, or entertainment? Do you do jobs yourself because no one else will do them to your satisfaction? Do you take over other people's responsibilities to make sure things are done right? Do people describe you as stubborn? If you have answered “yes” to most of these questions you might want to consider if you meet the diagnosis for OCPD. You see, Obsessive Compulsive Personality Disorder (OCPD) is a pervasive disturbance involving one's generalized style and beliefs in the way one relates to themselves and the world. The behavior style is often characterized with a preoccupation with details, rules, lists, & order, a perfectionism that interferes with task completion, an excessive devotion to work and productivity, an overconscientiousness and inflexibility about matters of morality, ethics, or values, excessive interpersonal control and rigidity and stubbornness. People with OCPD are usually so typically deeply entrenched in thinking that their way of functioning is the only "correct" way, they hold family and friends to their own strict (often errant) standards. While people with this style of thinking will tell you that "all is not well," they tend to be deeply committed to their own beliefs and patterns. It is the belief that "my way is the correct way" that makes them resistant to changing one’s life. Yet, letting go of this rigidity is paramount in their recovery. At this point, you might still be asking, “Wait a minute, now ambition and striving for perfection are also psychological disorders?” You might even be wondering how psychologists reconcile this diagnosis with a healthy Hashkafas HaTorah. After all, who among us hasn’t noted the concept of Shleimus – of perfection, as a primary goal of Yahadus? Why be concerned with a pervasive preoccupation with perfection? The Malbim (HaCarmel) distinguishes between two similar Torah concepts – Temimus and Sheleimus. While on the surface these two concepts seem similar, Temimus refers to perfection. It is a notation that implies no blemish whatsoever. Sheleimus, refers to a complete achievement – doing the best that is possible for the particular type. Rav Hirsch (Berashis 33:18) adds that this concept of Sheleimus must involve a certain internal harmony within the individual striving for it. To the person with OCPD, these stages are never possible. Perfectionism as expressed by the OCPD is not the admirable quality often sought by the world at large. The OCPD perfectionism entails checking and rechecking "completed" tasks to be absolutely sure that there are no imperfections. It could literally take upwards of 10 to 20 minutes to fill out a check or mail an envelope due to a rigid need to ensure that there are absolutely no mistakes. It is as if, to make a mistake which might be noticed would ruin ones reputation for life. Perfectionism could also take the form of a need for over completeness -- reading and rereading material until a sense of absolute clarity exists. Not only is it extremely time consuming but the overall content of the story is lost. The forest is missed while examining each leaf, of each branch, of each tree. This disposition can also have an adverse impact on one's conversational style. In the course of a conversation sometimes information is sought which involves such minutiae that the questioned person becomes lost and frustrated. Slight inconsistencies or mistakes, within another's conversation, are often perceived by the OCPD sufferer. These details, no matter how peripheral to the conversation, must be brought out into the open and clarity must be achieved. Dovid, a 20 year old Yeshiva bochur, was suddenly faced with a dilemma. While in High School he was a genius, completing Bekius Mesechtos and acing exams both in Limudei Kodesh and secular studies. Now involved in full time learning, he couldn’t concentrate on the text of the Gemara if he couldn’t visualize every word. The Gemara’s concepts he got but his Chavrusos complained to him that he was spending too much time “visualizing” trivializations like what Rava or Abaye looked like or intoned when they made a particular statement. These issues can create problems at school and in the workplace. From early adolescence, through college, perfectionism can take an otherwise straight "A" student and bring him to the brink of failure due to incomplete assignments. Having to get the term paper exactly correct is an almost impossible task. At work too, perfectionism and a need to repetitively check minor details for errors can prevent OCPD employees from finishing projects by their deadlines. Additionally, an insistence on observing even the most insignificant regulations, the need to micromanage projects, and obvious criticism and contempt for subordinates, can lead to conflict with, and alienation from others. Menachem’s hard work finally paid off. He was hired by a major accounting firm to work – where else – in the auditing division. His boss asked for a quick assessment on a particular assignment that he was working on. After two days, the boss complained to him that the assessment was long overdue. Menachem noted that he had done the assignment within the first 2 hours of its request but was reluctant to call it “complete” until he had reviewed it to his own satisfaction. That satisfaction, he told the frustrated superior, was still forthcoming. When events stray from what a person's sense of how things "should be," bouts of intense anger and emotional discord are characteristic. But Shani’s case highlights yet another aspect of OCPD- dichotomous thinking. Dichotomous thinking is the tendency to categorize all aspects of life into one of two perspectives -- "All good" or "All bad." It can take only one stain or blemish to have the person completely find justification in discarding anything which evidences a flaw. With such high consequences at stake, the desire to maintain “perfection” is evident. At the same time, the tension of maintaining that perfection is anything but Shaleim. Indecisiveness: Another critical aspect of the OCPD thinking style is indecisiveness. When almost all decisions seem to take on the same paramount importance and being correct is imperative, making even simple choices can become a nightmare. Persons with OCPD can become stymied in life due to an inability to establish with certainty which choice is the correct one. Not unusual would be for someone to spend over ten minutes attempting to choose the correct pair of socks which best matches their tie. They tend to place a great deal of pressure on themselves and on others to not make mistakes. Within OCPD the driving force is to avoid being wrong. Since continuously making the correct choices in life, seems to be an impossible task for us humans, there is a regular source of discontent available for OCPD sufferers. Malki’s parents were exasperated. A bright, beautiful girl of 26, Malki had been “on the market” looking for a Shidduch for 6 years. In Malki’s case, the same pattern seemed to repeat itself constantly. First she would be interested in a guy. Then they would date and become somewhat serious. However, Malki would “hold back” when the proposal of marriage would come. Each time she would find something apparently trivial that would “bother” her and slow her down. “I don’t know” she would say, “I can’t decide if he is THE ONE.” She would seek advice from anyone who would listen but then reject it for one reason or another. Eventually, the guys would end the relationship. She had been “serious” with 5 great guys already. Treatment options: The treatment of OCPD is incredibly complex and thus beyond the scope of this article. Generally speaking the focus of Cognitive-Behavioral treatment for OCPD entails helping these individuals develop a greater tolerance to the notion that the world is exclusively made up of navigational gray, not the clearly defined black and white lines of rigidly held beliefs. Having someone identify that these thinking styles are a handicap at all is a monumental achievement. The treatment would most likely focus on breaking down and intervening on specific individual aspects within the spectrum of OCPD. Social skills training and role-playing might help facilitate a more effective style in relationships. Assertiveness training would facilitate one's ability to make requests or provide feedback such that the receiver of the information not be alienated. Overriding all of the specific interventions would be a sensitivity to helping the sufferer relinquish their dogmatic belief system. Letting go of “perfection” is a tremendous ambition. The dividend it pays is incomprehensible. One great resource for articles on OCPD and OCD is Dr. Steven Phillipson’s website www.ocdonline.com. What's worse, (1) using the power of the presidency to capture and detain dangerous terrorists or (2) using that office to negate legal, valid and binding contracts. I vote for (2). Please, read this post by R' Horowitz, head to his site, and comment with your (real) name so as to create a real voice that shows the frum world will not stand for such things. We should stop using politically correct terms like “misguided youths” to describe cowards who beat women for sitting in the “wrong” sections of buses and physically assault peaceful citizens who do not dress according to their standards – observant or otherwise. “Misguided youth” implies that they engaged in a prank like a water fight or that they went overboard in pursuit on a noble goal. There is nothing noble about these acts – or the terrorist mentality that glorifies them. Democratic Florida voters should be ashamed of themselves. NoyG has some of the excerpts written out. My goodness. Watch this video and wonder if you too can be in Congress. Yes, you can, and you'd probably be 100 IQ points higher than what's there now. Wow. In case people have not noticed, I've been (and will continue to be) on vacation for a little while from blogging, at least anything of substance. Even hobbies can use a vacation sometimes. We're in the process of thinking about, if not doing, a lot of things around here, some more serious, many less serious but equally as time-consuming. The past week consisted of Purim, Marty Madness 2.0, our annual fantasy baseball draft, a quieter but still full Shabbos, and taking a car full of Pesach dishes and a beautiful set of books from my grandparents' apartment, and more; the next week will be helping them move out, another (less serious) draft, March Madness, figuring out where to put things/moving lots of things to storage, helping Serach develop her businesses a bit more, and really starting to plan the future a lot more closely. Oh, and Elianna is turning three (!!) years old in a week, which is slightly insane. I am feeling very old at the moment... it's easy to forget that we're still just 25 years old. I also hope to make an announcement later in the week about something we're really excited about. It's a cold world out there in these hard economic times, especially in the world of hockey. But meet Ben Gullett, who whipped up a unique scheme to help find his dad a new job. March Madness X - Want to join? It's a pretty standard pool, with the points per game by round being 1-3-5-9-11-15. It's $5/entry, maximum of three entries. If you're interested in joining, just comment here with your e-mail or e-mail me at serandez@gmail.com with the title "NCAA Invite Please". "Could a greater miracle take place than for us to look through each other's eyes for an instant? We should live in all the ages of the world in an hour; ay, in all the worlds of the ages. History, Poetry, Mythology! - I know of no reading of another's experience so startling and informing as this would be." "I think that we may safely trust a good deal more than we do. We may waive just so much care of ourselves as we honestly bestow elsewhere. Nature is as well adapted to our weakness as to our strength. The incessant anxiety and strain of some is a well-nigh incurable disease. We are made to exaggerate the importance of what work we do; and yet how much is not done by us! or, what if we had been taken sick? How vigilant we are! determined not to live by faith if we can avoid it; all the day long on the alert, at night we unwillingly say our prayers and commit ourselves to uncertainties. So thoroughly and sincerely are we compelled to live, reverencing our life, and denying the possibility of change. This is the only way, we say; but there are as many ways as there can be drawn radii from one centre. All change is a miracle to contemplate; but it is a miracle which is taking place every instant."